Posted April 1, 2019, in Featured News, News, Student News. Chika Enwereji was born and raised in the heart of the nation’s political environment, Washington, D.C., a factor that has inspired her career path and influenced her declaring a political science major. “Riding the train everyday you’ll always see professional men and women with their suits on ready to go to office, and that kind of appealed to me” she revealed. When it came time for Chika to choose a college, she decided to step away from the center of politics and what was familiar. She chose Rutgers University–Camden due to the example set by her older sister, a Rutgers alumnae. Fast forward eight years later and she’s about to graduate from the Honors College of the same school she had visited as a teenager. During her time here, she has been able to secure an internship with Assemblywoman Carol Murphy, in Cinnaminson, New Jersey. “I drafted policy memos. I’ve visited elementary schools to discuss the legislative process. It’s given me a lot of insight and it’s also been a lot of fun,” she recounted about her internship. Developing her thesis was quite a lengthy process. “Finding this data was challenging due to how old the data was,” Enwereji revealed. “I had to find [the] data of drug arrests for three different counties in Maryland from the 1990s all the way up until 2000. Not to mention, I also had to determine the demographic of these three counties within the same time frame in order to address racial-profiling and systemic racism within police departments.” In the end, she was able to acquire the information she needed from the resources and staff, specifically Research Librarian Julie Still, at the Paul Robeson Library here at Rutgers–Camden. As Chika’s time on campus comes to an end, she plans to take a gap year upon graduation, allowing her time to gain work experience in her field and study for the LSATs. 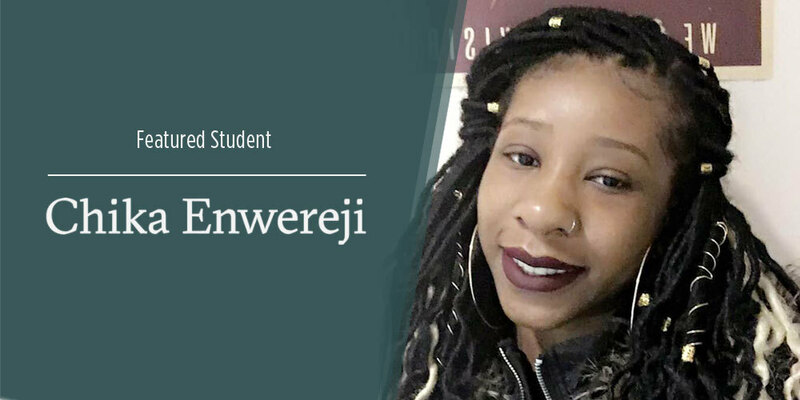 In particular, Chika is thankful for the friends she made during her time at Rutgers University–Camden. Page last updated by Faculty of Arts and Sciences at 9:41 am April 1, 2019 . This page was printed from http://fas.camden.rutgers.edu/2019/04/01/political-science-major-chika-enwerejis-undergraduate-career-sets-path-for-future-as-defense-attorney/ at 1:08 AM Wednesday, April 24, 2019.